TOKYO-- Fighter pilot Jun Fukuda sits edgily on the couch in his flight suit, waiting for the call that sends him sprinting to his jet. On any given day, he will chase and warn off Chinese military planes nearing Japanese airspace. The 35-year-old motorbike enthusiast and soon-to-be father is a captain in the fighter squadron based at Naha, the nearest Japanese base to islets in dispute with China. The single squadron at the Okinawan capital operates in a high-octane environment, scrambled on average more than once a day -- a record of more than 400 times in the year through March 2014. China outnumbers Japan almost eight-to-one in air force manpower and is building its capacity, debuting its newest stealth fighter in November. Even so, Chinese pilots lag their Japanese counterparts in training and experience, raising the risk of a near miss or collision. The fly-bys also highlight the obstacles to warmer ties between Asia’s two largest economies. As the Japanese pilots on stand-by watch television, read and sip tea in a lounge, the atmosphere is tense, according to F-15 flying Fukuda, who goes by the call-sign Mars, the Roman god of war. To save time, they wait in the tight-fitting anti-G suits needed to protect them from otherwise deadly acceleration forces, and keep life jackets and helmets in their planes. When Major General Yasuhiko Suzuki was first posted as a fighter pilot to subtropical Naha in the 1990s it was a military backwater. Now the commanding officer, he says China’s assertiveness has made it Japan’s most important base. Prime Minister Shinzo Abe is seeking to bolster Japan’s defenses, particularly in the southwest islands. On Naha, buildings are being demolished to prepare the way for a second squadron, set to move to Okinawa by March 2016 and double the number of fighter jets to about 40. The military won’t disclose how many pilots are in the current squadron at Naha. Japan is set to establish a new military observation unit on Yonaguni island, close to the contested outcroppings. The defense budget for the year starting April includes funds for amphibious vehicles and the development of a nascent Marines-style unit on the southern island of Kyushu. Plans are in place to ferry troops from as far away as Hokkaido in the event of a conflict. Japan and China each claim ownership of the uninhabited islets -- known as Senkaku in Japan and Diaoyu in China -- that are administered by Japan. The dispute has been cited as a factor behind an almost 39 percent drop in Japanese investment into China last year, even as China was Japan’s top trading partner in 2013. China says it has records of the islands going back about 600 years and that it administered them until it lost a war to Japan in 1895. Japan sent aircraft to head off foreign military planes flying close to its airspace a total of 744 times in the nine months to December 2014, up more than 30 percent on the same period the year before and heading for the highest annual total since the end of the Cold War. While dispatches against Russian aircraft are back down after an increase last year, sorties against Chinese aircraft, almost all from Naha, have continued to rise. China is probably seeking to glean data through its fly-bys, said Bonji Ohara, a research fellow at the Tokyo Foundation, a former navy pilot and ex-military attache at Japan’s embassy in China. “They can see what the delay is before planes appear, and gather information about Japan’s response,” he said. In 2013, China set up an air identification zone covering the disputed islands, sparking criticism from Japan and the U.S. Last year Japan protested after Chinese fighters flew “abnormally close” to its military planes on two occasions. China has also complained about the activities of Japanese military planes. China is rapidly expanding its air force -- boasting a total of 398,000 personnel according to a 2013 White Paper on defense. It is updating its equipment and training to catch up with its neighbor, long seen as the benchmark for the region. 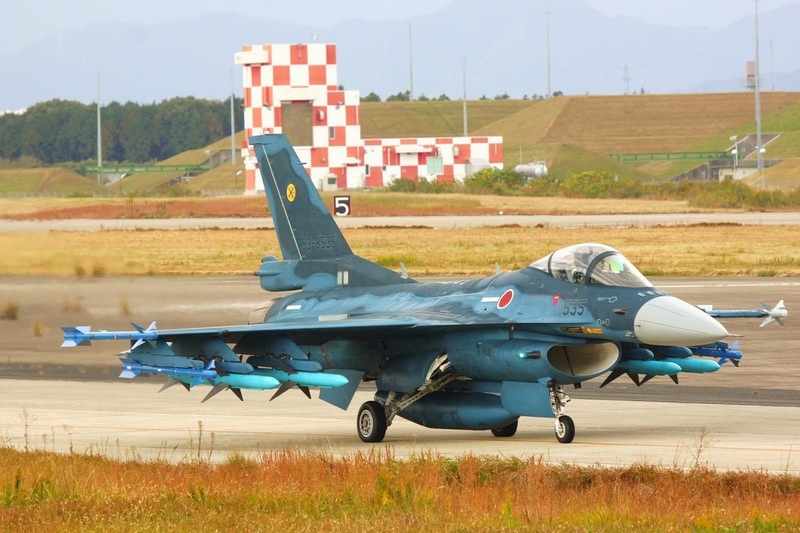 Japan’s Air Self-Defense Force has about 50,000 personnel. China says its domestically produced J-11 aircraft is similar in capability to the F-15, which was first introduced in the U.S. in 1974. It has more recently developed the stealth J-20 and J-31, while Japan has opted to buy the Lockheed-Martin F-35, though it will not initially be deployed to Okinawa. It’s not just a lack of numbers that hampers Naha’s 83rd Air Wing. The base shares a single runway with the adjacent civilian airport. While scrambles take priority over passenger flights, fighter jets embarking on daily training sessions must wait in line behind planes taking visitors back to Shanghai and Beijing, as well as Taiwan and the Japanese mainland. Fukuda said he joined the armed forces because he wanted to become a pilot and travel, rather than a desire to defend the nation. Now that his wife is expecting a child this year, his feelings have changed, he said. Japan Air Self-Defense Force Mitsubishi F-2A - 4.5th generation multirole fighter manufactured by Mitsubishi Heavy Industries and Lockheed Martin.